Are you one of the user with Eudora files looking for Eudora Migration Tool to perform migration from Eudora to Outlook or Eudora to Apple Mail! Then no need to worry about this anymore, we are here to fix it up and will surely discard all your worries. Simply read the article and you will get the solution for sure. Eudora is the email client application for desktop computers that runs on Mac and Windows operating system. Nowadays, the Eudora light mode versions are available i.e. Eudora OSE – is available since July 2010 with POP3, SMTP and IMAP protocols and store emails in a modified MBOX format file. MBOX files are plain text files that contains a group of messages stored in a mail folder. Previously, the email application came free of cost, but now it is commercialized. It is available in different forms i.e. Sponsored, Paid and Light. The availabilities of various amenities like security features, authentication, add-ins, spam-filtering and etc. of Email Address Book and other present categories which depends completely on the mode being used. However, still there are some disadvantages associated with it. Therefore, user prefer for Eudora migration to Outlook or Eudora migration to Apple Mail or Eudora migration to many other popular commonly used email client file types. 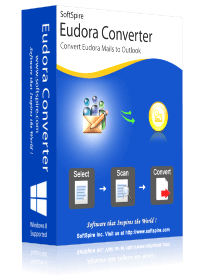 Convert Eudora Emails to PST, MSG, EML, EMLX, PDF, MBOX, HTML, RTF and MBX. Eudora use mailbox (.mbx file extension) to store email folders on the local system hard drive. However, the default location of MBX files varies according to operating system, OS versions and the account type it is configured with. Moreover, for each Eudora email folder, it creates the separate MBX file. For example, In.mbx file represents INBOX folder, Out.mbx is for Outbox folder, Sent.mbx for Sent Items, Drafts.mbx for Drafts, Junk.mbx for junk folder and etc. The attachments in Eudora get saved in another directory called ‘attach’ and the embed images of the email messages are preserved in another directory called ’embedded’. Why Migration from Eudora to Outlook is needed by a user? The Eudora email communication provider saves its emails in mailboxes with MBX format whereas Windows Outlook stores the data items in PST format. The reason behind this is that .mbx file extension is the proprietary file format of Eudora application whereas .pst is the file extension used by MS Outlook. Hence, if users are looking to access Eudora emails in Outlook then it becomes necessary to migrate Eudora to Outlook. Moreover, the Eudora email client support has been discontinued by its vendor. And due to this also many users are planning to switch from Eudora, then MS Outlook would be the prudent choice. 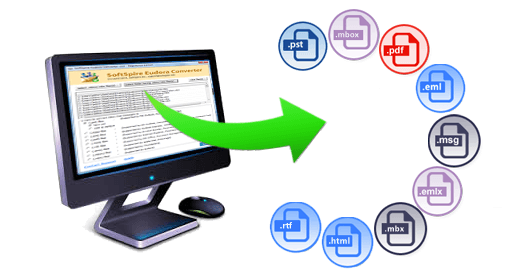 And in order to perform the transfer, you require Eudora files into Outlook PST format. How to Migrate Eudora Mailbox to Outlook? Two ways are available to perform the operation i.e. Manual or using third party tool. C:\Documents and Settings\(local account name)\Application Data\Qualcomm\Eudora. Now, all the Eudora mailbox data get successfully exported from OE to MS Outlook. And if you are implementing this email migration, then you need to be very careful because the small mistake could lead to severe data disaster situation. To get rid of any possible issue, you need to create the backup of existing mailbox data of Eudora. In spite of this, you require a deep knowledge about configuration of email account and other similar concerns. The process is very tedious, time consuming and cannot be performed on large scale. So, if you want to carry out the required operation of email conversion without any issues imposed, then you should think about professional and reliable Eudora Migration Tool to implement migration from Eudora to Outlook. Eudora Migration Tool is an All-in-One application that is not only limited to the Eudora Migration to Outlook but also provide the option to perform Eudora migration to Apple Mail, Windows Live Mail, Adobe PDF, HTML, RTF, MSG, CSV and etc. with precise information without altering the originality and other attached properties of the content. You can download and install the tool on all versions of Windows OS including Windows 10. It is recommended to first try the demo version of Eudora Migration Tool which is totally free of cost and provide every bit of knowledge on the conversion of Eudora to the desired format. With demo version, you are able to convert first 25 messages from each Mailbox folder of Eudora email client to the required format in a single time.